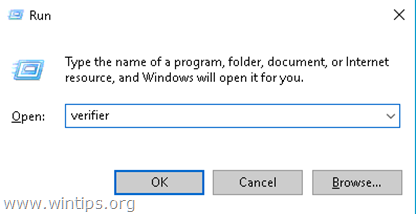 How to Find Out Which Driver Cause Windows to Crash with a Blue Screen using Driver Verifier. How to diagnose your computer's Memory (RAM) for problems. How to diagnose your hard drive (HDD) for hardware problems. In this tutorial, I 'll show you how to find which driver on your system causes your computer to crash with a Blue Screen, by using the Driver Verifier Manager. 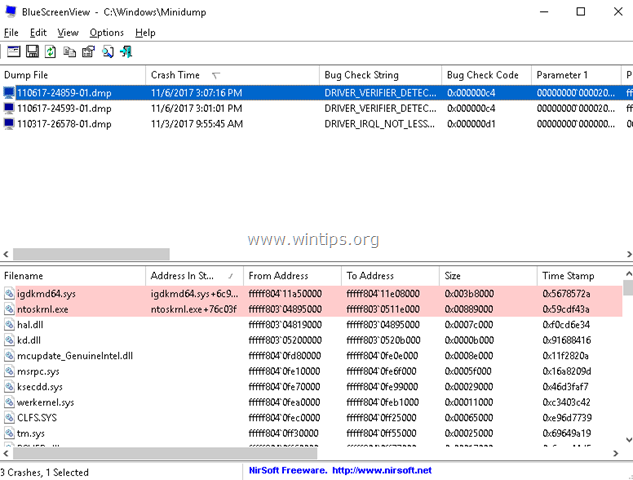 The Driver Verifier is a built-in tool, in Windows 7, 8 and 10 OS, that can help you to locate which driver makes your computer to crash with a blue screen of death (BSOD), by stressing the installed drivers on the background. Keep in mind, that you may not run the Driver Verifier Manager for a very long time because your computer will crash often. 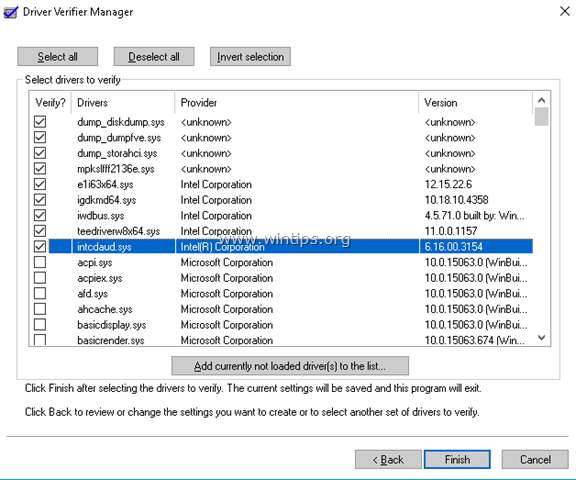 How to Use Driver Verifier to Locate Faulty Device Driver(s) in Windows. 2. If you 're using Windows 10, 8 or 8.1, enable the F8 'Advanced Boot Options' menu, is order to easily start your system in Safe Mode, if Windows cannot boot. Step 1. Enable Driver Verifier. 1. Press Windows + “R” keys to load the Run dialog box. 2. 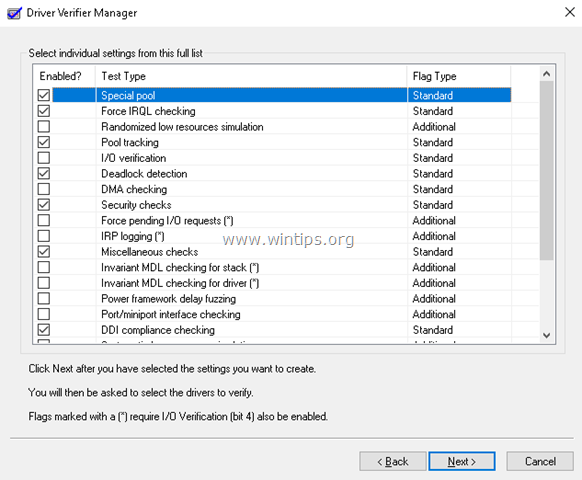 Type verifier and press Enter to open the Driver Verifier Manager tool. 3. At the first screen, choose Create custom settings (for code developers) and click Next. 5. When done, click Next. 6. Then select driver name from a list and click Next. 7. Sort by Provider's name. * Note: Scroll down the list to view and select all non MS drivers. 9. Click OK and then restart your computer. 1. Press the Power button for 5-7 seconds to fully shutdown your computer. 2. Turn ON your computer and continuously press the F8 key to access the Advanced Options menu. 3. Navigate with the down arrow key to Safe Mode option and press Enter. 4. See the instructions below to Disable the Driver Verifier. 5. Continue to Step-2 to find out why your computer crashes. To disable the Driver Verifier. 2. Type verifier and press Enter to open Driver Verifier Manager. 3. At the first screen next screen, choose Delete existing settings and click Finish. 4. Then, click Yes (to save changes) and OK and then restart your computer. Step 2. Find Out which driver cause your system to crash. * Note: You can download even the full Installer or the Portable version of the program. 2. Open BlueScreenView. The program will automatically show a list with all the recorded blue screen crashes by analyzing the DUMP files. (.DMP files). * e.g. 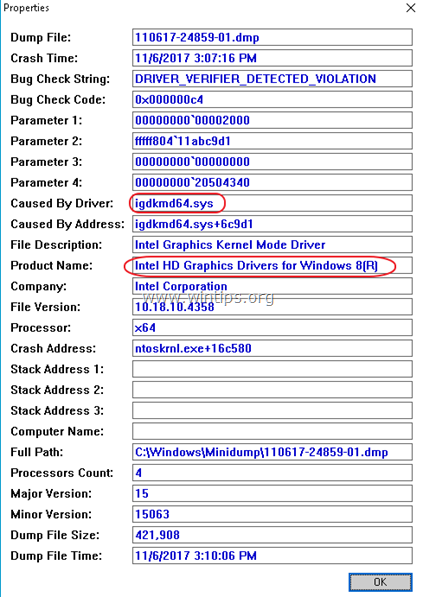 At the screen below, the defective device driver is the "igdkmd64.sys" which belongs to Intel HD Graphics Adapter. 4. Once you find out which device driver causes your system to crash, completely uninstall and reinstall the latest driver for that device. « FIX: You need permission to perform this action – Cannot Delete Folder or File (Solved)	» FIX: CPU Not Running at Full Speed in Windows 10.